← Kyrie Irving is not the rookie of the year. James Harden: The NBA’s Best 2-Guard? Like most years in recent memory, the NBA’s best sixth man this year is a crafty left-hander with sky high shooting percentages. Only this year his name isn’t Manu or Lamar. It’s twenty-two year old James Harden, who has been playing out of his mind so far this season. Indeed, he is not only the top candidate for the NBA’s 6th Man of the Year Award, but he is also one of the primary reasons for the Thunder’s early success. Harden’s numbers declined noticeably his sophomore season, but no one noticed because he improved with regard to everyone’s favorite stat, points per game. 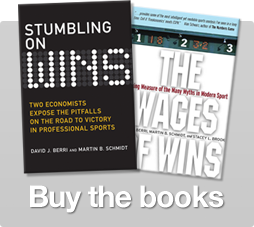 Still, Win Score numbers favored Harden, and Doerr predicted him to be one of the best rookies in the 2008-09 NBA season. The numbers tell a simple story: Harden’s production is so high because his shooting is fantastic. This of course has both good and bad implications: it is good that so many of Harden’s shots go in the basket; it could be bad in that he might not be able to sustain this high percentage. Perhaps bad isn’t the right word; the point is that if Harden’s shooting regresses to the mean to some extent, his production might not stay so high. Given how high his effective field goal percentage is, this is very likely to happen. 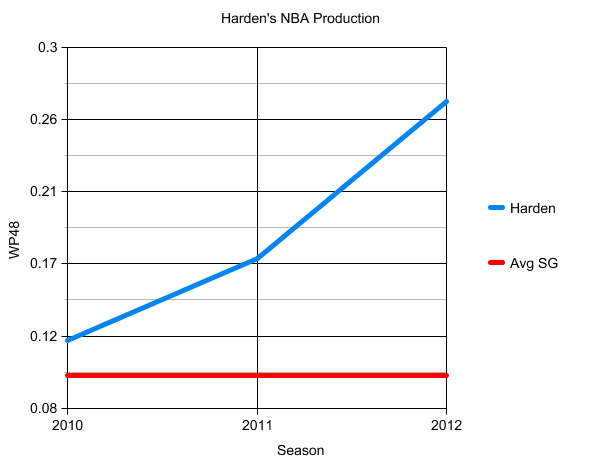 But even without the ridiculous shooting, Harden is a good player. In particular, he is a very good passer and rebounder. He has also generally been good at creating possessions and taking care of the basketball, though his steals and turnovers have been worse than usual this year. 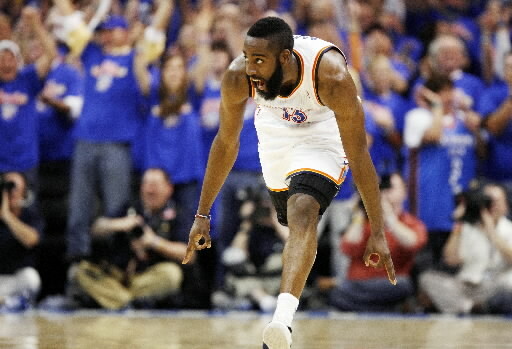 Because the Beard has been so productive this season, the impact he has had on his team is undeniable. Aside from Kevin Durant, no Thunder player has had a more positive impact on wins than James Harden. Including Durant, Harden has been the most productive per-minute player that has logged meaningful minutes on the team. Indeed, if Harden’s minutes were replaced with an average player (or Daequan Cook), the Thunders would be expected to win about two fewer games at this point in the young season. 6 Responses to "James Harden: The NBA’s Best 2-Guard?" Anyway, you jinxed him. Last two games he has shot the ball poorly. He hasn’t played quite as well when starting for Thabo who has been out with a foot injury. Brooks seems to prefer him leading the second squad vs. other teams seconds. I wonder what sort of implication (inflation?) this has on his production. I think the secret was already out. I mean, he averages over 16 points! per game off the bench (the only statistic anyone cares about). That’s enough to draw some attention, right? As for playing against backups, I’m not sure how accurate that is. I realize he comes off the bench, but he has played more minutes this season than anyone on the Thunder not named Durant or Westbrook. That suggests he’s spent a good deal of time playing against opponents’ first string. I wonder if more people would be convinced of Harden being great and Kobe being average if they looked at the net difference between them. 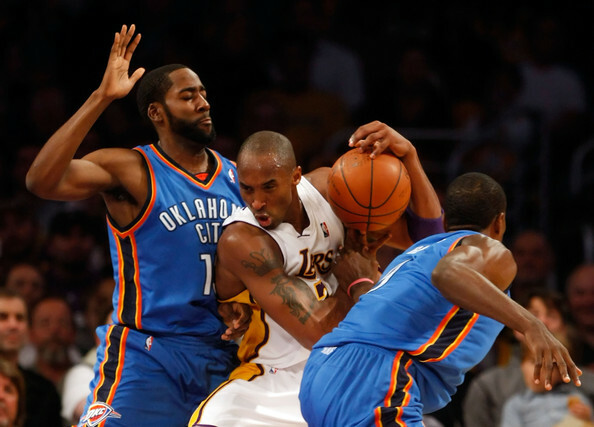 Take Kobes minutes, Points, FGA, FTA etc, subtract Hardens equivalent stats, Divide each number by Kobe Games played. Simple math, and I’d guess most people would see the remainder Kobe as a really bad player. I would guess most people who are fans of Basketball would view that as an inefficient gunner. Just an example of framing the argument in a different manner might convince people of an argument. Unfortunately, the people who believe Bryant>Harden are unlikely to read this blog.